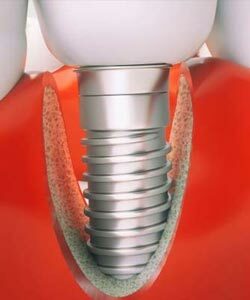 Most dental implants last a long time but there is one long-term risk that comes with dental implants. It is a condition called Peri-implantitis. It is an infectious disease that causes inflammation of the surrounding gum and bone surrounding an implant. This leads to gum disease and bone loss which affects the durability of the implant. In severe cases, the implant may be lost and the infection and loss of tissue can spread and affect adjacent teeth. There are a number of reasons why bone and tissue loss may occur after a dental implant is placed. Implants have come a long way and they are wonderful tools for protecting the look and functionality of the mouth, but no surgery is without risks. There will always be a chance of something happening when you put a foreign item in the body. If your dentist tells that dental implants are 100% successful and are a worry free option, you would be well off seeking another opinion and going with another dental team for your implant needs. Peri-implantitis is very difficult to treat. Fortunately, the vast majority of people with dental implants never develop it. For the unlucky few who do develop the condition, they are often totally unaware that they have bone loss in their jaw because of the implant. It generally progresses in a painless fashion and it is not until more advanced stages where symptoms may become apparent. Peri-implantitis is often now symptomatic, and in most cases, there is no pain. Most report mild pain or tenderness when chewing and eating or a slight change in sensitivity in the area around the affected implant. You can also develop a bad taste if there is an infection present. In severe cases, pain may be present and the implants may feel loose and unstable. The long-term goals when treating peri-implantitis are to stop the progression of bone loss and maintain the health of the implant. Sometimes a bone graft will need to be done to replenish the bone tissue that has been lost. Tissue grafting to repair damage to the gums may also need to be done. In some severe cases if there is too much damage to the bone structure, the implant will be lost and it may not be possible to install a new one. In cases like this, other methods for dealing with the loss of the tooth may need to be investigated. Regardless of how the issue is dealt with, the most important factor in treating peri-implantitis is to get rid of the bacterial infection and keep the area healthy and clean and free from infection in the future. This can only be done with proper brushing and flossing habits! To get answers to your questions about treating and how you can take better care of your teeth and gums, contact us today.